Canning season is almost upon us. I can feel the throws of fruit picking mania just over the horizon. Last year was our first real initiation into the U-Pick market. We learned a few things. While waiting in line for our peaches to be weighed, we ogled the fruit crates of an older man in front of us. He had his red wagon train stacked with peaches, all nicely nestled and perfectly balanced. Nothing was bruising as he bumped along the gravel road. There was serious skill here. This man had canning season down to an art. We proceeded to ogle and awe further vowing to take on his Jedi-like fruit season knowledge. Our one hundred pounds of peaches started to soften and bruise the instant we brought them through the door last year. A frenzied, sticky day was spent peeling, slicing, and canning. Jules had to finish up all by himself (gulp!) due to me needing to go to work that evening. We figured we had at least two days to split the canning up into. We were totally wrong. When a stack of pallets was up for grabs on a street corner, we grabbed them. Later, we saw an older fruit crate at an estate sale and grabbed it, too. Together, these would become our coveted fruit crates. The construction of a fruit crate is remarkably simple. The important parts are 1) to leave air spaces between the slats so the fruit can have air circulate all around it preventing spoilage, 2) no sharp edges inside so that the fruit could become bruised or ripped open, and 3) stackable but not resting on the fruit. These fruit crates provide all that and cost about 50 cents a piece using salvaged wood. 'Trol around on Craigslist or Freecycle a bit and see if you can find any pallets up for grabs. They can easily be sliced apart to form light weight, uniform boards. If the size of your deconstructed pallets isn't exactly the same, just go with it. Miter the corners of these boards at a 45 degree angle 3/4 of an inch in from the corners. The mitered edges allow the crates to stack without bruising the fruit. Now that all the pieces are cut, you just have to stack them up and have a lovely assistant (that's always my job) hold them in place while you nail things together. As much as the assistant isn't completely necessary, they make things a ton faster (and it gives me a job when Jules' works). Have your lovely assistant hold the front and back boards while you nail the bottom boards on one at a time. There should be a 2 inch gap down the center of the crate to allow airflow. Cover the nails holding the bottom boards with the bottom support board, by carefully nailing it on top. This board provides added structure to the crate for fruits picked hard and therefore extremely heavy (like pears). This piece also allows for additional airflow when the crates are all stacked together. 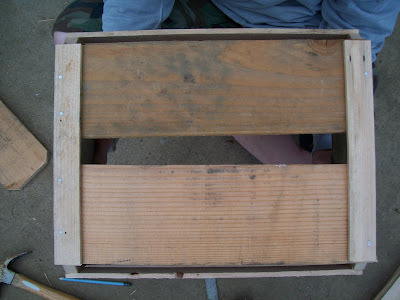 Turning the crate up on one side, carefully nail in each lattice board leaving a gap down the center for airflow. Flip the crate over and do the same thing on the other side. Now you just have to make a whole bunch and head on out to the orchard. Wow, how handy you two are. I just use old plastic buckets but these are much lovelier but wouldn't work for blueberry picking that's for sure. Oh my I LOVE THESE! We sell at 2 farmers markets and these would be wonderful to display our produce in. Thanks! This makes it look so easy...if you have the right tools! Thanks for sharing. Good design for fruit. I'm working on building some larger ones with more latticed bottoms for curing sweet potatoes. In Michigan, they have to stack together under a tarp or in a small structure in which heat can be applied because it sure isn't reaching 80 degrees anytime soon in October, at least not for the two weeks required. Thanks for the great breakdown. Thanks for sharing, been trying to find fruit boxes with no luck. I love to reuse and recycle. Starting a rootcellar and these will work out great for storage. I just found this post on Pinterest I cannot wait to make some of these crates. Peaches are so great here in Nor.Cal from summer till fall. Thanks for a great post can wait to read more. Ways to Lower the Grocery Bill: Where's the Beef?